Easy DIY Pirate Hook Craft – Aaaarrrrgggghhhh! Aaaarrrrgggghhhh! Whether you’re planning to make a whole pirate costume for Halloween, or just looking for a fun craft project for Talk Like a Pirate Day, check out this easy DIY pirate hook craft! 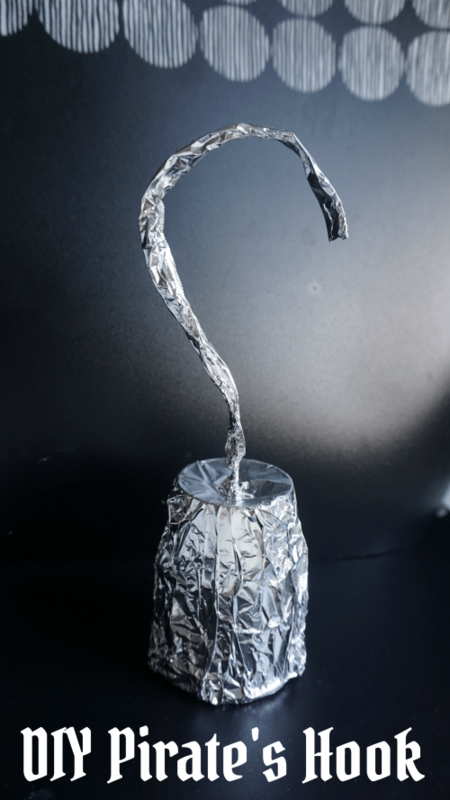 You only need a few standard household items – a paper cup, a pipe cleaner and some alumininum foil – for your kids to have everything they need to make their very own pirate’s hook. The key item here is to use the right size of paper cup! You want one that is big enough to fit over your little one’s hand, but you don’t want it so big that it will easily fall off or be awkward for them to maneuver. We found the small size of paper party cups to be just right. Ok, it’s time to get on to the craft! Cut a piece of aluminum foil approximately 12″ long and place shiny side down on table. Place cup on top of foil, right side up. Wrap foil completely around cup. Cut a small piece of foil about 1″ long. 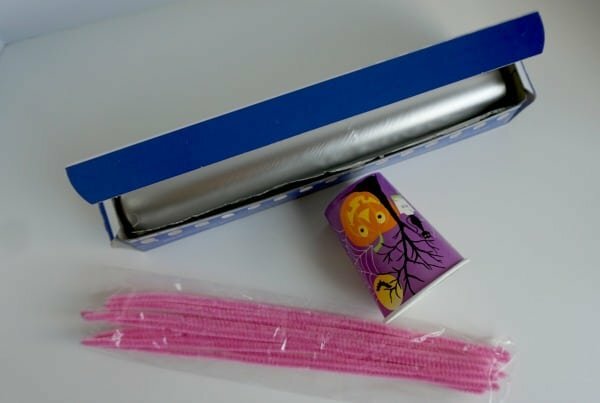 Lay pipe cleaner on foil with about 2″ left free of foil. Wrap shiny side out. Twist pipe cleaner into hook shape. 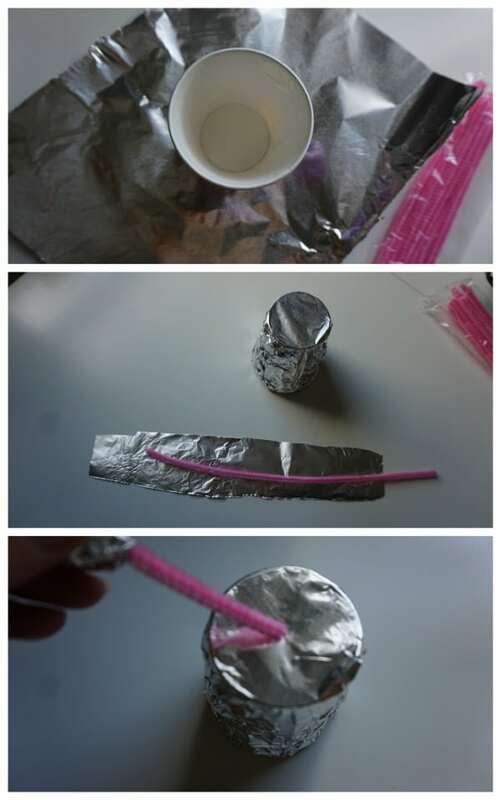 Push non-foil covered end of pipe cleaner through the top of the cup. Loop pipe cleaner end inside of cup to keep it in place. You’re done! Nice job and you have patience to do things like this. How easy to make and perfect for Talk like a Pirate Day or Halloween! Love it! This is such a neat craft to do with the kids and would be great for a Halloween costume. This would be great with Halloween coming up. It’s surely a lot less expensive to make it then it would be to buy it in a Halloween store. My son loves pirates and already saw this over my shoulder as I was reading your post. Apparently we have to make this…now! OMGosh my youngest son would have a blast with this hook. I will have to try to make it with him! Pirates are awesome. This looks so easy and inexpensive. Pirates are a popular costumes. This is great for a DIY Halloween. I am going to have to make this with my son. 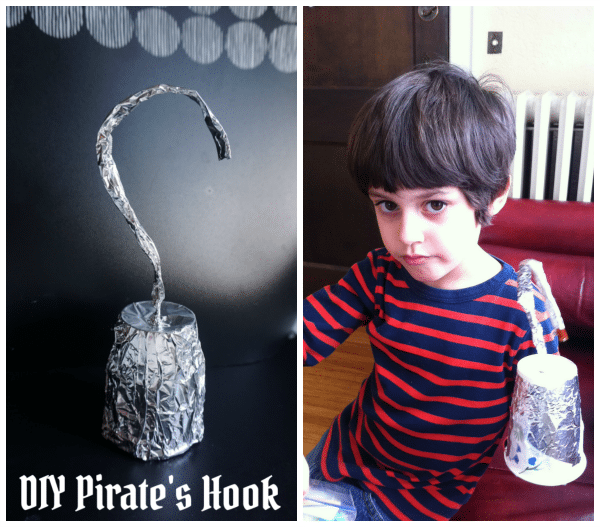 He would love making this Easy DIY pirate hook. What a cute craft idea. Mu grandsons would love this. This is such a cute idea and easy to make. I know a little boy who would love this! Cool! My daughter would love to make this. N0w heres something my grandson would love. Goes with his pirate sword and hat! Even though it looks like Captain Hook, it is a cute approach to making Halloween very special. This project looks like it is perfect for the coming weekend! I thank you for having a great blog and for sharing this fine idea with us. This would be a fun and easy craft to do with my son sometime!